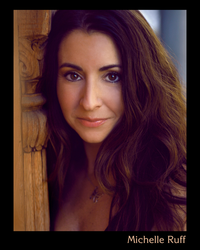 Michelle Ruff, originally a midwestern girl from The Motor City Madhouse, now hails from Sunny Los Angeles. She's a fan fave for numerous video games and anime titles. Michelle's an MSU Grad with her Improv and Acting training from Chicago's Second City Theatre, Player's Workshop and Improv Olympic. You can hear Michelle as some of your favorite anime characters including Sinon from Sword Art Online 2, Young Satoru from Erased, Sakuya Tachibana from God Eater, Rukia Kuchiki from Bleach, Yoko Littner from Gurren Lagann, Fujiko Mine from Lupin the Third, Yuki Nagato from The Disappearance of Haruhi Suzumiya, Anri Sonohara from Durarara, Luna from Sailor Moon Classic and Sailor Moon Crystal, Yukari from the Persona 3 & 4 Series, Jill Valentine from Resident Evil Revelations, C-Viper from Street Fighter, Robin from Fire Emblem, Cream the Rabbit From Sonic the Hedgehog and many others. She lends her voice to the Judge Dredd Superfiend series as Kid Sydney, Stephanie and Lacy from Disney's Lego Friend's of Heartlake City and National Wildlife Federation Characters Skip the Rabbit and Miss Sally from Wild Animal Baby Explorers and the latest installment of "The Good Guy-Chuckie" from The Childsplay Film series. Michelle also lends her voice to TV shows and feature films including popular animated features like The Angry Birds, Kung Fu Panda 3, Home, Madagascar, The Wind Also Rises and Peabody and Sherman. If you listen close you can hear her voice in popular films like Batman v Superman, Fast and Furious 7 and TV shows like Arrow, Powers, Grimm and Supernatural.